www.PNWJeep.com • View topic - What have you done to your Jeep today? What have you done to your Jeep today? Post subject: What have you done to your Jeep today? Im not a player, I just post alot. I was kind of surprised this thread hasn't been started yet. I'll start. I added 1.5" seat risers. They may be a hair tall but I'll work though my problems. The seat height is SO much better than stock. I can actually see the hood over the cage. Post subject: Re: What have you done to your Jeep today? I finished prepping the motorhome that will be trailering the TJ to the Hammers in three days. "97 Jeep Grand Cherokee Rolled"
I will be bleeding my brakes again after I get off my 12 hour shift at work tonight. Buy a car from me at Lee Johnson, Chevrolet, Mazda, and Kia. I finished loading stuff into 2 Jeeps that will be loaded into the race trailer for a trip to The Hammers in 3 days. For the third consecutive year, we have a Jeep that rolled out of the shop after a full build into the trailer without any real testing, and off to JV to work the bugs out. Unpacked my camping gear so everything could dry out. I put a new vanillaroma tree in it a couple days ago. Why does my nose hurt? And you only really wheeled one of them right? Lifted , 4locked and armored. Payed off my shop bill, so I have a green light to go break more expensive stuff. Not a jab I think I forgot that you got out a bit in that Jeepster. I bought a big tub of Damp Rid. Picked up my machined shafts and rotors from Dean yesterday and put them onto the jeep. Making some progress on the rear disks. Me too, for the dodge. You weren't kidding, in two weeks there was so much moisture in there the frost was thicker on the inside if the windows. Then slammed the door to get my dome light to shut off. Cherokee, 4 mud tires, right hand glove box. new tires, new alternator, new fan shroud, wired up the high idle switch that has been in there for 4 years. Who are they? Oh, that's my network. 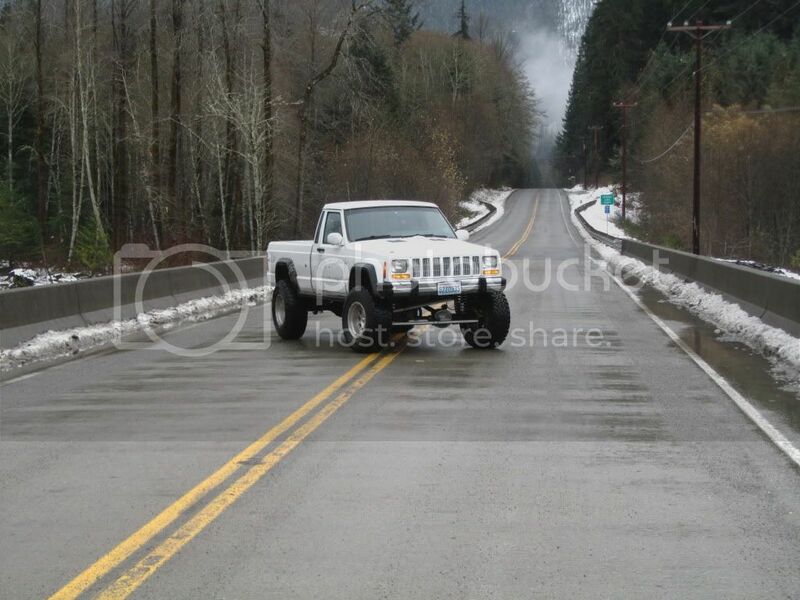 2000 Cherokee, 4.0, AT, power windows, custom wheels and tires. On a gravy train with biscuit wheels. I cut 5.25 inches off the long side axle tube of the Dana 60 front. Cut the C off and cut the old tube out. All cleaned up and now I am waiting to for the front shaft that I had shortened. When I get the shaft back I will check it in relation to how muck tube I cut off, reset the C , check my angles , then weld the C back on. I will end up with a 64 inch wide HP dana 60 front.